So, I went to York and have to tell you – first and foremost – that this is a wonderful, charming, fascinating destination. LOVED it. York is picturesque, full of things to see and do, and is so easy to navigate, you can comfortably walk every bit of it. On another note, I have to comment further on my last post referring to York’s reputation as one of the most haunted cities in Europe. I can’t speak for the rest of Europe, but I’m here to tell you that yes, York is haunted. And while I wasn’t adamantly opposed to the possibility before, I’d say I wasn’t inclined to put much store in the notion of ghosts, hauntings, etc. After my visit to York? Well, let’s just say that now I’m a believer. While in York I had the pleasure of meeting Patricia Ong, owner of tour guide company York Walking Tours. I should point out that Patricia does not conduct one of the spooky nighttime tours in the city (and there are several to choose from if you go to York and seek activities that will scare your pants off). But Patricia has been leading tours for a while and knows all the folks who work in places like the Treasurer’s House – which she believes is the most haunted building in York. She shared a number of goose bump-inducing stories that I won’t go into right now. The tale she told that gave me the shivers was about the man who witnessed the Roman soldiers marching through the basement of the Treasurer’s House in 1953. Read my last post for the story, and/or look it up online. It’s been reported many times over the years. But here’s the thing: Patricia knows the man it happened to and has talked with him about it personally. Harry Martindale was just a young apprentice plumber working in the basement on a boiler (or something – see – I’ve already forgotten, sorry) when he heard a trumpet call and witnessed a legion of Roman soldiers appearing from one side of the basement and disappearing into the wall on the opposite side. He was so frightened, he fell off his ladder, but was too scared to move. The men, and their horses, were in living color and appeared so real to him, he was afraid that if he drew their attention, they might attack him. These were no translucent, ethereal ghosties! No, he could see the sweat and the dirt and hear the sounds of the horses’ hooves. Martindale claimed the soldiers carried round shields and wore green tunics. Historians reading his account said that while round shields had been used in Rome, the traditional large rectangular shields were the only kind used in England. The experts also noted that tunics made of a green plaid fabric (and I’m thinking, really? They had PLAID back then?!) were an unlikely sartorial choice. Guess what? Fast forward 50 years or so and excavations at Hadrian’s Wall, located not too far north of York, yielded long-buried fragments of the round shields not previously known to be used by the Romans settled in the U.K.
And when an ancient Roman burial ground was uncovered recently near York’s train station, some fabric remnants were tested and turned out to be – you guessed it – green plaid. In addition, workers digging between the Treasurer’s House and another site uncovered a substantial road leading toward the ruins of Roman army headquarters nearby. The Roman highway passed just a couple of feet below the basement in Treasurer’s House, finally explaining why the ghostly soldiers were only visible from the knees up. I also learned from Patricia that while Harry Martindale’s experience may have resulted in the most detailed documentation of the marching warriors, this was not the first, nor the last time that people caught sight of Roman apparitions in York’s spookiest basement. In fact, over the years staff and guests have seen Romans as well as a number of other ghostly visitors in every room of Treasurer’s House. Cold drafts where no window is open. Doors inexplicably locked from the inside – when no one was home. An overpowering scent of lavender with no flowers or perfume in sight. These are the messages from beyond to those who work at the Treasurer’s House. 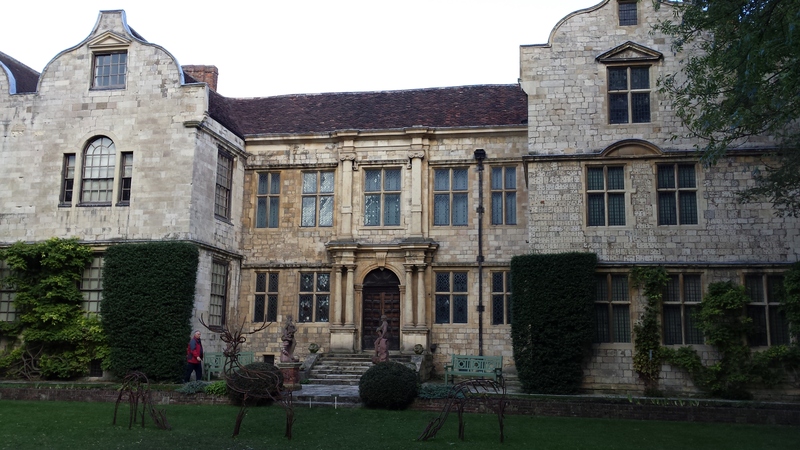 This entry was posted in Travel, Uncategorized and tagged England, ghosts, haunting, Roman soldiers, travel, Treasurer’s House, York, Yorkshire. Bookmark the permalink. awesome post….cant wait to visit there! Thanks, buddy – and we will have a blast!